You are here: Home / Cats / Does your cat have High Blood Pressure? Did you know that cats can suffer from high blood pressure in a similar fashion to people? Is your cat over 7 years old? Eleven human years are equivalent to one cat year so your cat can age very quickly! High blood pressure (Hypertension) is a common problem as cats get older. In studies, hypertension was diagnosed in more than 1 in 20 of apparently healthy older cats. Make sure that once your cat is over the age of 7 that he or she is getting checked annually against this silent killer. We can do this at your cat’s vaccination appointment or you can come in and request it separately. 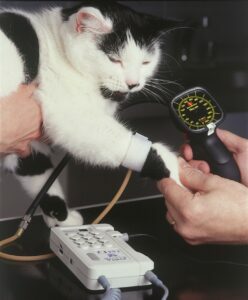 Taking a blood pressure reading for a cat is very similar to when your doctor or nurse takes your own. A small cuff will be placed around your cat’s leg or tail and depending the type of machine used the cuff will be inflated and deflated to determine the blood pressure reading. It only takes and few minutes, does not hurt and most cats do not object at all. Older cats are more likely to develop kidney and thyroid disease, arthritis as well as high blood pressure. 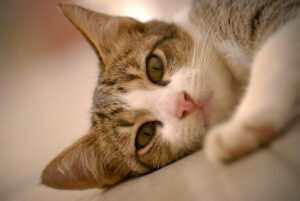 These problems are manageable and treatment will improve your cat’s quality and length of life. A quick visit to the vet can help identify problems like this and get life-saving treatment started as soon as possible. Did you know that cats instinctively try to hide any discomfort they are feeling? This is because in the wild they are mostly solitary and need to protect themselves from other predators, so for protection they do not make it obvious that they are injured or unwell. Look out for any slight changes to your cat’s normal routine. 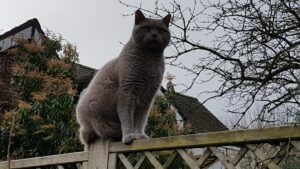 Owning a cat can reduce the risk of stroke and heart attack by a third, it can help to lower our blood pressure so it is only fair to look after your cat’s blood pressure too!! Return the favour and bring your cat in for a routine blood pressure check. Not only is high blood pressure a silent killer in cats over 7 but it can also warn us of other diseases your cat might be at risk of. What are the benefits of owning me (or rather me owning you)? Make sure your cat enjoys his or her twilight years in comfort. https://www.withygrovevets.co.uk/wp-content/uploads/2019/04/Withy-Grove-logo2.png 0 0 Michael Clarke https://www.withygrovevets.co.uk/wp-content/uploads/2019/04/Withy-Grove-logo2.png Michael Clarke2018-05-15 17:21:222018-06-27 11:34:03Does your cat have High Blood Pressure?